Puzzle games are so addicting on mobile. They’re one of the few genres that get me hooked and aren’t just mindless tapping games. While I am always on the look out for something new, many times a lot of new games just copy gamepaly from older games which gets old, fast. That’s not the case with Kick9’s game, Puzzle Monster Quest. 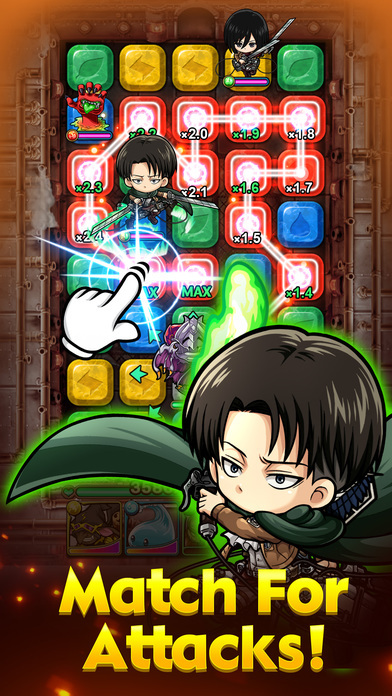 I admit though that what drew me into it at first was the fact that it has a collaboration with the Attack on Titan franchise but I was pleasantly surprised to discover the that gameplay is quite deep and addictive. 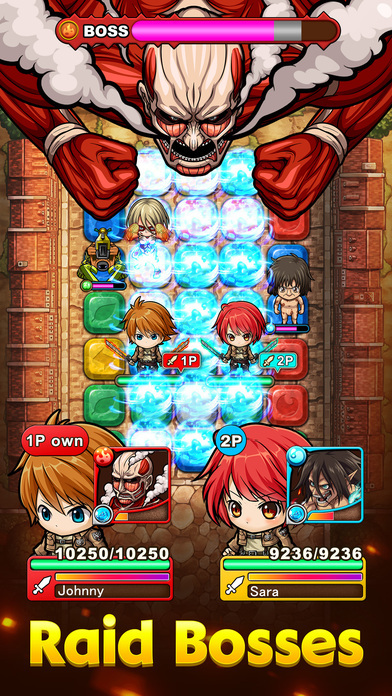 Puzzle Monster Quest plays very much like an RPG puzzle game. The puzzle portion of the game is pretty standard where you match colors to move around the screen and remove blocks. However scoring isn’t the main goal of the game, destroying monsters on the playing field is. You destroy monsters by moving next to them with each block that you pass near them, your character and their team will do damage to that monster. The more blocks you chain together before attacking, the higher the damage multiplier is. What’s neat too is that there are elements involved as well. The four colors used represent a different nature element and each has its strength and weaknesses against another. You need to take that into consideration when you attack certain monsters, especially the bosses. That means you don’t really want to take a team of water monsters into a lightning dungeon, unless you happen to be crazy strong. Which brings me to monster collecting. As you progress through the dungeons, you earn eggs that can hatch into monsters. You can use these monsters as part of your team or fuse them with other monsters to make them stronger. You can also gain monsters by summoning them at the temple in exchange for crystals or friend points. The monsters you summon here are generally stronger. 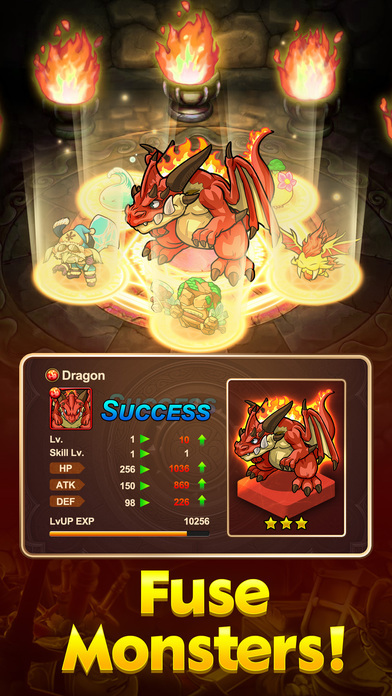 Monsters can also evolve when at max level and become even stronger versions. Monsters too have different elements assigned to them. Monsters aren’t the only thing you’ll be collecting. You also be crafting weapons and armor to strengthen your character. Crafting material is gained while playing through the dungeons and you use these to make items at the smith. These items have vary in rarity with rarer items being more powerful. Weapons and armor too can be fused to strengthen as well as evolved to form more powerful items. There are a couple issues with the game though. First up, I still have no idea how to play multiplayer in it (Android version), even though it’s listed as a feature. It seems like it’s something that’s just not implemented yet though it makes reference of it throughout the game. All I see is single player and no multiplayer. Secondly, progression in the game is going to be kind of slow. You’ll have to grind through a lot of it to level up decently and to gain new monsters to use, or you can pay to win, which a lot of people might just do. Aside from those little issues, Puzzle Monster Quest has been crazy addicting. I haven’t been able to put it down since downloading it. The levels themselves are pretty challenging and I’m still trying to put together a decent team to take on the higher level dungeons. There’s a lot of little details to learn about the game and I’m discovering something new almost on a daily basis. I love the combat element mixed in with he puzzles as well as the RPG stuff. It makes for a deep game that so far has kept me coming back for more. Warning! Warning! The monsters are destroying the village! Your bravery is required at once, hurry and protect the locals. Your trusted fur ball companion Izzy is waiting to get you up to speed! 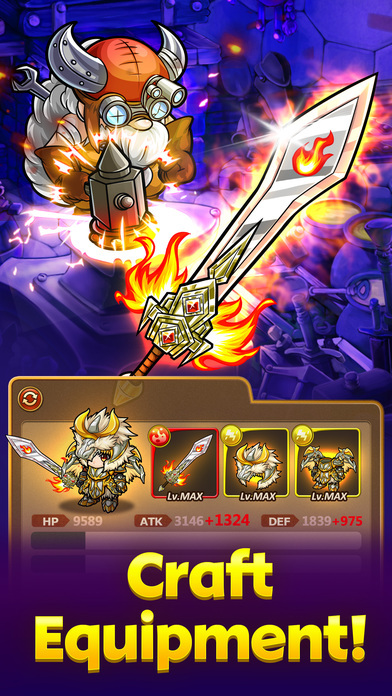 On your journey Swipe, Match, and unleash Powerful Attacks! Become addicted as you guide your hero though treacherous dungeons, be wary of enemy monsters whom you can catch and add your team’s party! 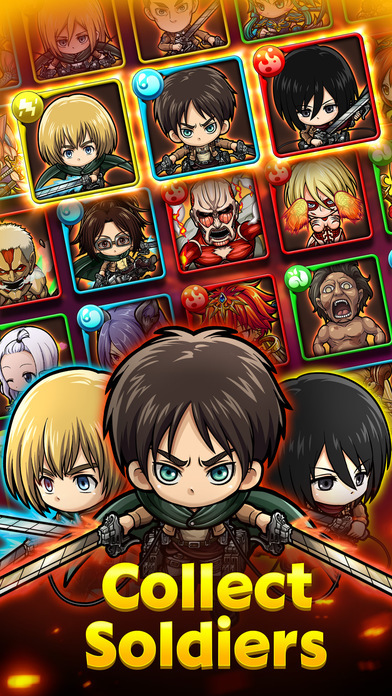 -17 unique monster and heroes including Captain Levi, Eren Jaeger, and Mikasa Ackerman! -Special Attack on Titan themed dungeons and Temples! -Match tiles of the same color to create paths to navigate your hero! -Match tiles leading to an enemy monster to release an attack! -The greater the amount of tiles matched, the greater the attack strength! -Link 15 or more tiles to launch a Bravery Chain! -Forge weapons and armor by visiting your local blacksmith! -Craft rare materials to create mythical equipment! -Over 1000+ monsters to attack, raise, and call your friend! -Evolve and strengthen your monsters through each journey and victory, create the ultimate party! -Interact and form alliances with fellow dungeon explorers!